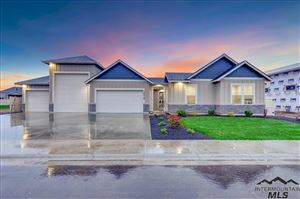 Star Idaho real estate offers something for everyone who embrace Idaho’s rural character, but desire easy access to the resources of the greater Boise metropolitan area. Star Idaho real estate is located west of Boise downtown about 16 miles on Highway 44 - that’s just a half hour drive in a car or just under a one hour bus ride via the public transportation system. Star Idaho real estate offers great value, rural location with easy access to the neighboring cities, and the opportunity to be part of a community on the move! Highway 44 east to west comprises the southern border of Star, while Highway 16 leading out to Emmett in Gem County make up the easy boundary of Star Idaho real estate. There is great variety in the types of real property for sale in Star, from commercial building pads prepped and ready to build on, to mini-ranch estates on several acres in the rolling hills and cornfields north of downtown Star. New construction is evident throughout the community and quality builders like Trident Homes are responsible for many of the well appointed homes in the area, some of which you may see featured in the local Parade of Homes - a bi-annual real estate and builder industry event that showcases premier builders model homes in the greater Treasure Valley areas. Home prices vary as much as the real estate selections, ranging from brand new construction by Trident Homes in the mid-$250k’s for a 3-bedroom, 2-bathroom, three-car garage, approx. 2000 square feed and just minutes from downtown Star; To McMansion-style estate homes on more than an acre and built along the ridge tops of Deep Canyon Drive, well appointed often times with granite countertops and hardwood flooring, priced anywhere from upper $390k’s to mid-$500k’s. When you see the value in these types of homes, you’ll realize why many consider Star Idaho real estate to be a diamond in the rough! What I really enjoy about Star Idaho real estate is the location. Star was actually named for its location, with a “star” on a farmhouse demarking the route for travelers in the 1800’s. The rural community has managed to maintain its rural character in the face of recent development and the community’s citizens find themselves locally invested in the real estate scene, with places like the Star Mercantile being owned and operated thru multi-generational lines of the same family. It’s not uncommon in the summer months to find kids enjoying the rope swing where Star Road crosses the Boise River, or to find folks riding horses down the side of the many country roads that surround Star Idaho real estate. Star Idaho is like the gateway between Idaho urban life and the great outdoors - Everything east and south of Star leads to more developed areas; While everything west and north of Star leads in to the mountain foothills and the more agrarian communities of Payette and Gem Counties. The community has been able to hold on to the ‘small-town” feeling because people who reside in Star Idaho real estate recognize that is one of the qualities that make Star a great place to call home. Star Idaho real estate is a diamond on the rough because of the great location and the people who make the community a truly wonderful place to live. It’s a place close enough to the action to enjoy great entertainment and special events, but far enough off the beaten path to make you feel close to Idaho’s great outdoors. There’s a great life and plenty of fantastic deals on real estate waiting for you in Star - Call Benjamin Christensen at 208-501-8557 if you would like to learn more about this amazing town or if you would like to receive additional information on Star Idaho real estate.